While his survey is by no means comprehensive, I enjoy his commentary and occasional snark (see his reviews of the stuffed pizzas at Bartoli's, Edwardo's and Milano's), which are sure to raise some hackles. Even if you disagree with his perspective, this is an entertaining read that must have required a herculean effort on his part. I think someone who obviously hates stuffed pizza has no business rating it. It's like asking a Greenpeace activist to rate his favorite petrol-chugging, fume-belching muscle cars. On several occasions when he was dismissing a pizza as borderline inedible, I thought to myself "geez, that's one of the best stuffed pizza joints in the city, what is this guy talking about?" Sure enough, three of my favorite spots ended up in his Top 5 list even as he made it sound like you have to choke 'em down to eat 'em. ld111134 wrote: Even if you disagree with his perspective, this is an entertaining read that must have required a herculean effort on his part. Herculean effort to say the least! I've already benefited from Dolinsky's pizza survey. In his Top 5 Tavern Style Pizzas number #4 is Side Street Saloon, a pleasant old school tavern I never heard of 6-blocks from where I work. I asked for my small cheese, sausage and onion pizza well done, as Dolinsky suggests, and thoroughly enjoyed every bite. I'll be back soon. Side Street Saloon, count me a fan. ^^ A little OT but Side Street Saloon was one of my lunch stops when I was a dog walker in the neighborhood back in the 90s. I always got their ribeye sandwich; good value for money IMO but I'm not sure if that's still the case today or if it's even still on the menue. I'm actually surprised SSS has managed to hang in there through the Napervillization of the Southport corridor. 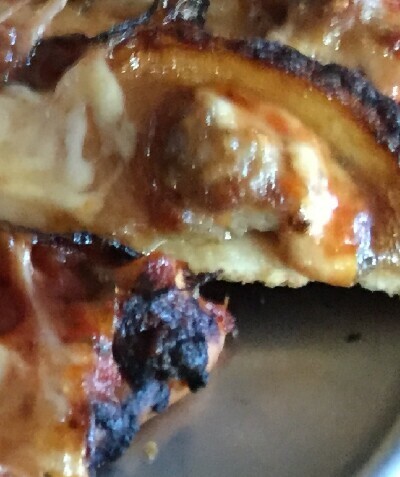 Maybe it's just the way this picture came out, but that crust doesn't look all that thin to me. It looks like the bready pseudo-thin pizza served at lots of 2nd tier places around town. Hopefully, it was better than that. stevez wrote: Maybe it's just the way this picture came out, but that crust doesn't look all that thin to me. Though Side Street Saloon was grouped with thin crust icon Vito & Nick's this particular top 5 was Tavern Style, Top 5 Thin may be found --> Link. What's important to me is I liked the pizza at Side Street Saloon and am happy to have found new spot thanks to Dolinsky's admirably obsessive "Pizza Quest"
I'll have to give Side Street Saloon a shot. GWiv has never steered me wrong when it comes to pizza. Never heard of it, but the other four in the top five I can agree with, though Barnaby's kind of falls in the "other" category for me as an idiosyncratic style of pizza that I do happen to really like the once a year I visit my accountant in Northbrook. That said, it's not really what I think of as a classic tavern style pizza, but I'm not sure what category it would fit better in, other than thin crust. Interesting list with many places I have never even heard of. I am most curious about Bartoli's for deep dish and The Boiler Room for NYC style as they weren't even on my radar. Any comments on these? I am continually surprised that no list ever mentions Fox's Pizza in Beverly. A neighborhood icon that is always near the top of the list when a southsider makes one out, it flys waaaay under the radar. I grew up eating there and Vito&Nick's and I now live close to (any thoroughly love) Villa Nova - it ranks with both of those champions. Thought Side Street Saloon deserved its own thread. Side Street Saloon, count me a fan! PUT*MORE*STUFF*ON*THE*PAGE! I want more words! More pictures! And stuff MOVING! The next food related fund-raiser for PMI & WLPN could be "Get Sliced" in which Bridgeport pizza parlors shall be challenged. Its fundraiser tickets are sold via Eventbrite. Obviously, it took a while. But Lumpen is finally proceeding with "Get Sliced". It will occur on Friday, 1 December 2017 at the Co-Prosperity Sphere. It sounds intriguing. I am impressed that they manage to keep the cost of these events below average ($30). I will probably go to this. I would enjoy being accompanied by others from LTHF. You would constrain me from being too exuberant talking about the food we would be served. I don't care if Dolinsky's getting blasted by the Piece folks. He's right. I remember trying their pizza a few years back when my daughter lived in Wicker Park. I said to meself, self--if this is New Haven pizza, I don't want to go to New Haven. Mike Gebert's conversation with Dolinsky in Fooditor is the type of tete-a-tete feature piece at which he specializes. Yummy stuff, and between the two of them--just like that--Chicago pizza is immediately put into perspective. I've written for Mike & know first-hand the painstaking detail-orientation that drives him. And his even-handedness is a quality Nagrant wishes he had. jnm123 wrote: I don't care if Dolinsky's getting blasted by the Piece folks. He's right. I remember trying their pizza a few years back when my daughter lived in Wicker Park. I said to meself, self--if this is New Haven pizza, I don't want to go to New Haven. I couldn't disagree more. I think Piece turns out excellent pizza - one of my favorites in town, though, I cannot say whether or not it truly reflects the style. Their crust is hearty and flavorful with complexity all the way through the chew. There aren't many I like more. Fights over religion aren't ever fun. Agree with Ronnie, personally, I think Piece, especially their white pizza, is very solid (disclosure - I mop down grease on all my pizzas, from everywhere). Even more so when you consider the beers they make that are unavailable elsewhere. Even putting aside personal preference, Piece has withstood the test of time and continues to do great business. To exclude them from a purportedly comprehensive review of Chicago-area pizza places raises very serious questions about the objectivity of the author. The fact that Jacobs and Piece may have been unwilling to comp something, or otherwise play ball with Dolinsky, and that went into his decision to exclude such a popular place, is a very valid criticism (if true, of course). So, there's no truth to the story that he's known as the hungry hound because he has a dog palate? Any views on his book Pizza City, USA? I think that it’s a great guide to Chicago’s diverse pizza scene, even if it doesn’t feature Piece (a favorite of mine, too). The book is a collation of the reviews that he had previously posted on his website (most of which have been taken down). Frankly, I’m shocked that nobody here has an opinion on this book. ld111134 wrote: Frankly, I’m shocked that nobody here has an opinion on this book. I think that means the opinion is..........nobody bought the book. I treat Dolinsky in kind of the same fashion as I treat Guy Fieri (though on a local as opposed to national level). I don't necessarily agree with all his opinions and/or restaurant choices, but I appreciate that there is someone who is bringing many of these establishments more into the public awareness. Hi- I was inthe bookstore in Winnetka last week, and I saw a flyer for a pizza bus tour Steve is hosting. He is also hosting a few pizza walking tours in Chicago. Dolinsky Podcast, October 24, 2018, which I hosted and was on the events board.